Malaysia’s Mohd Azlan Iskandar and Australian Kasey Brown pulled off notable upsets over British opponents in the second quarter-final session in the Commonwealth Games Squash Championships in Delhi to claim unexpected places in the play-offs for medals at the Siri Fort Complex in the Indian capital. Brown claimed her second win over Northern Ireland’s Madeline Perry in two weeks when the sixth seed from New South Wales fought back from two games and 7-3 down to beat the fourth-seeded world No5 5-11, 6-11, 14-12, 11-9, 12-10 in 84 minutes. 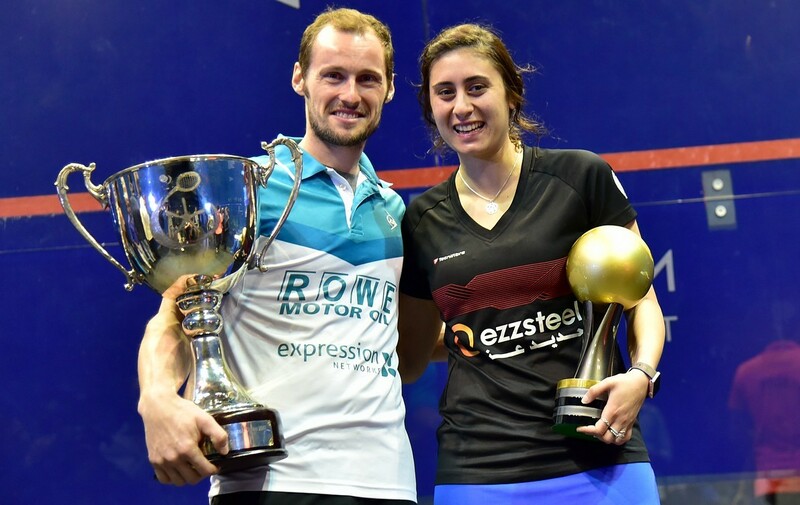 “She came out firing at the start,” said Brown, who beat Perry in a 100-minute marathon in last month’s Women’s World Open in Egypt. “But it was a matter of sticking to my game-plan – of being positive. “I’m feeling at the top of my game at the moment – and I’m as fit as I’ve ever been. I’m playing better than I’ve ever done before,” added the New York-based world No8. Brown agreed that her surprise world championship win over the Irish champion was “a real confidence-booster”. In a match littered with interruptions, sixth-seeded Malaysian Mohd Azlan Iskandar beat England’s No4 seed Daryl Selby 11-6, 7-11, 13-11, 13-11 in 135 minutes – a time which included an injury break of 15 minutes while the Englishman received treatment for a dead leg caused by an accidental collision with his opponent. “We’re big friends,” explained the Malaysian number one afterwards. “We’ve played together since we were juniors at 13 – and we’re now both 27, so that’s 14 years of friendship. We both like to play hard. “It looked pretty bad on TV, and I apologise for that. Surprisingly, Selby felt no bitterness towards his opponent: “It was a brutal match. He dictated the play in the first game and deserved to win it. I played a lot better in the second – I was a lot more positive. But every time I thought I had him under pressure, he lifted the ball well. After saving five game-balls in the third, Selby squandered one of his own at 11-10 which would have given him a 2/1 lead. “If I could have taken that game ball in the third, it could have taken the stuffing out of him. “I was happy with the way I dug in. Then there was the dead leg in my left calf in the third game – which was a pure accident. “We’re great friends off court – we have a lot of respect for each other – but we both want to win. But today was his day – he deserved to win. He played the best he’s ever done against me. I gave everything I had. Earlier in the session, firm favourite Nicol David reached the semi-finals for the second successive time after beating England’s fifth seed Laura Massaro 11-5, 11-3, 11-7 – recovering from 6-4 down in the third game. 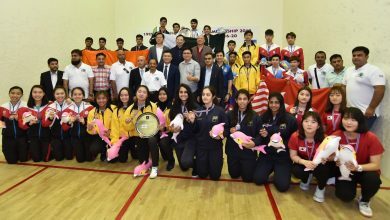 It was four years ago in Melbourne that the Malaysian, again the favourite, ended up by finishing in a disappointing fourth place – out of the medals. Asked how different things are this year, from 2006, David was quick to respond: “I’ve learned so much in the last four years – trying to find myself. I have added a lot of things to my game. Massaro, ranked six places lower in the world list, was downcast: “It’s disappointing. I just feel it was a hammering – especially in the first two games. I’ve done well against her in the past – and had some expectations. “She looked completely on it. I also think that’s the best she’s ever played against me – I just couldn’t get in front of her. The final match on the all-glass showcourt started some two hours late – and finally finished around 45 minutes after midnight when England’s second seed James Willstrop overcame veteran Australian David Palmer, the No5 seed, 9-11, 8-11, 11-5, 11-8, 11-5 in 111 minutes after fighting back from two games down. There were several interruptions to the match, as the two players and their coaches argued with tournament officials about the slippery state of the court floor. Willstrop felt that, whilst the match had a great deal of significance, it was not a quality encounter. “It wasn’t very good – but he probably made me look average. I was obviously struggling. The court was causing us both problems – me more than him. The pair had been involved in a number of career clashes – one of the most memorable of which was Palmer’s defeat of the Yorkshireman in the 2008 British Open final, when Willstrop had match balls. “Yes, it was a sweet victory, looking at the previous matches we’ve had,” conceded Wilstrop. Palmer thought he played well. “But I’m disappointed, obviously. “I started to cramp up at the end of the fourth and struggled in the fifth. But I was physically OK – I just couldn’t push through. “I thought the court was fine,” concluded the 34-year-old from New South Wales.